Why didn't you call us?!? We could've at least done some comparisons with some of our gear while listening to some canned music. Oh well, hopefully we'll get together the next time. Jeff, you want a demo, I can have you one in late February, keep in touch. This brings back lots of memories of doing sound for clubs back in my formative years. The only element missing in your novel is fire. As in: "no apparent cause but of suspicious origin" (a category that seems to plague R&R clubs and discos). So, despite the hardships and frustration, you were perhaps lucky. I was lucky in that the only 2 times the system was firewood it was owned by the club. Other times, when it was rented (my gear) I had removed the system for other shows. It took me perhaps 4 episodes of ths nature befor I began to focus my efforts elsewhere when the vibe (evidence) indicated I should do so. Hey everyone, this Road Test rig is in Maryland in the hands of Jim Bowersox right now. It was going to move on, but the next person on the list tells me they don't have anything good lined up for it right now, so I'd like to get someone in that area to pick it up and play with it for a few weeks. If you'd like to mess around with this rig, PM Jim Bowersox or myself and we'll work something out! I'd really like it to wander around the Maryland/Delaware/Pennsylvania area for a while. Comes with covers, signal and power cabling, and a line driver/sub crossover. All you have to do is plug it in and rock! I'm an AV contactor and do some production work I'm in the MD/VA/PA area and would be interested in demoing these boxes. Are they looking to get into the install market as well? I should have a rig free mid-march, either in MD or NY. Keep in touch. Install market, live market, it's all the same to the boxes. Hi John, nice to see you here. Bennett this is the same John I sent you PM about. John you can have them when I'm done with them at the beginning of March, as long as you have my new speaker system installed by then. I'm expecting a discount for this. I need to get on the Road Test thread(this one) and demand your rig in mid-March, after the next two guys. If and when you get them within 60 miles (+/-) of central CT, I would like to come hear them. Depending on where they are and my schedule, even 90 miles would be acceptable. I may be doing an extended car trip through Jersey and down to Wash DC (and points further south) in March. Let me know if they are along that route. Once we get to early spring I can take possession of them and do listening/measurement tests outdoors. Could we have a report from each user? Is Jim currently in the list of auditor? Jim currently has the system, and I will be getting it on Saturday for about a month. I will post a report after I get them all set up. I do not have measurement software, so my report will be fairly subjective, but I'm going to assume it will be the nicest system I have ever used. The system will be set up in my church (small square room, that holds 200 max), and people are welcome to come hear or play with the system on Thursday's at 7:00 during our practice time, or you are welcome to come and hear it at any service. For anyone that comes out, I apologize in advance for the poor mixing location, and poor acoustics, as we are working on improving those things. Tom, I've got another, identical rig sitting on the dock in NYC right now, it'll be delivered to the Sub Shootout along with the subs. Then I'll have another rig to use up in my area, and you're one of the first on my list! I should have it available for a several week demo in late February, but if you just want to listen I could meet up with you somewhere. Wow, I would love to demo those during my yearly adventure in a public park. I always end up with way too much weight and not enough power. It's August 7-12th in Endicott, NY. 20 Watts per pound, dang!! Not a problem, Phil. Just remind me when we get a little closer and I'll make sure you get a demo. Awesome, I can just imagine the reaction on some of the local faces already! Franci and Alex have generously allowed me a month+ to test and present the speakers. Next week i will be able to A-B test them against Turbosound TQ445DP + TQ425DP's. Later oppotunities will hopefully include direct comparisons with L'acoustics and Alcons boxes. Do you think it would be possible to demo this setup down here in East Tennessee? I ve got a few different things I would love to check that size rig out on. One is traveleing to Florida in May. Probably looking to buy around the end of this year. A save as of the delay finder after it makes an Impulse Response would be nice. I was just reading through this thread again and I see I totally failed to follow through on this. My apologies! As I am conveniently in Slovenia, I grabbed my measurement mic and got some basic traces indoors (it was raining) of the 103, U61, and M1225. I've linked to the .wav impulse response files for the U103 and M1225. Will there be a demo rig in the Portland/Seattle oval anytime soon? I'd like to hear it, but don't really have means to play with it personally at this time. Even Bend, OR would work. Did you take those responses in the ground plane, or in free space? The gentle downwards tilt makes me think you must have taken them in ground plane, or is that just the general "x-curve" response you are going for? I hope you don't mind me confirming that. Ground plane, HF horn closer to ground. Did you angle the boxes down to get the on-axis response? No. So, to be exact, mic position was from 6 to 7 deg. off axis. Caleb, I don't have anything heading out your way at the moment, I need to get a rig down into the TN/Florida area first, and then I'd like to run one around the midwest. I'd very much like to get you something, as soon as I can spare some equipment I will. Our first set of measurements was on the ground, but then IIRC we moved to a pole for everything but the M1225, and these measurements should be from the pole mounting. Interesting.. If this is a true Ground Plane measurement, I wonder why Bennett's Smaart notes state 'pole mounted' and 'on stand'..?? Or were you guessing, Alex? Bennett, both myself and Matt Jordan are with in spitting distance of each other here in Idaho. We would appreciate um.... make that "LOVE" the chance to demo these little gems. Please add me/us to the list. Scott, I've got a rig going down to TN, and then to FL. When it's done there, maybe early June, I'll have it shipped to you. Bug me. I can guarantee ya that!! Bennett, Is there a system around NY state still? I'd like a chance to demo this system. I'm near Rochester, NY. Please let me know when a system may be available in this area. Tim, I've got one left, but I need it off and on... I can spare it for a few weeks at a time. You're about 4 hours away, however... why don't you drop me an email and we'll figure something out? Or give me a call. bennett.prescott (atsign) adraudio (dot) com. I think everyone is right here in this situation! I was noticing the TF of what Bennett later identified to me as the monitor wedge, which WAS measured against a half-space boundary, and therefore was showing the boundary effects. I scanned the curves very quickly, and that was the only one that caught my eye. First off, a big thanks to Bennett for getting these boxes down south. And now for some first impressions. 1) Extremely portable. Went to pick them up from the shipping company in my Ford F-150 and rain was coming. I was able to break the pallet apart and fit one sub in the front passenger seat (with the arm rest up), one sub in the extended cab behind the one in front and the top boxes behind me in the extended cab. (Monitors are shipping separately so I didn't have to work them in) Really didn't expect to get all that in the cab of my truck. 2) Very solid built boxes. 3) Was able to hook up tonight and run some canned music through the system. The system integrator made set up very easy. I like the flexibiliy to be able to run an aux send into the subs for aux fed subs. (I am a very big fan of aux fed subs)Also selectable HPF & Polarity inverse buttons, very nice details in a simple setup. 4)Oh by the way, did I mention the speakers ROCKED! Excellent level out of a small package, and clean even at high enough levels for the neighbors to be able to listen in. The tops and subs complement each very nicely when using the ASI 23. I am going to try them on my DriveRack also to see how that might work. I was a little sceptical about crossing at 70hz, I thought I might be losing something between 70 and 100, but so far it sounds like the tops can handle it down that low. I ve got a couple of bands to give these a whirl on and will be getting back with more thoughts and comments. Also hope to have some pictures. Where are you in TN? I'm interested in hearing them over in Asheville, NC. Im in Morristown, just east of Knoxville. Thats not to bad a trip for you. Come across the mountian on 26 into Johnson City, and the hit 81 to Mo'town. Ill put together a few possible dates. Or if you have something coming up you would like to hear them on we could work out an equitable solution. Make sure you try the subs coupled. In the coupled configuration they will easily outrun the tops. Also the ASI23 has no processing besides the 70Hz crossover and polarity inverter for the sub. All the other processing (eq, crossover, and limiter) is in the speakers. The ASI23 does give you volume control and some nice lights to know when your hitting the limiters. Did a acoustic gig last night. One guitar (Takamine, though an EWI active DI) and two vocals (both on AKG 535's). Set up both U103's and one ATA118. Mixed with my other new favorite toy, my 01V96V2. Had a little less than 100 peoples in a room about 75' x 50'. The guitar sparkled. Very tight mids and crisp highs. Vocals were very clean and intelligible. I think I would have to try very hard to bring out the 'mud' in these speakers. I have not done any measurements but from what I have heard the tops really shine in the 3-4Khz and 80-150hz range. Excellent fidelity. I am looking forward to mixing a full band on these. Thanks for the tip on coupling, it was on my list of "to do" with these guys. By the way this was one of my easiest setups in a while, powered speakers and subs, 01V, mics and direct box. If I only had a nice powered monitor for the set up..... Just kidding Bennett, I know you are working on it. Im having a blast with what Ive got. I got a chance to mix on an Eona rig this weekend and I liked it quite a bit! I was mixing sidestage monitors for an outdoor festival and Bennett was kind enough to supply 4 of the 12" Eona wedges for the front 4 mixes, the single 18" sub for drum fill, and 2 of the u103's, one for drum fill top and one for cue. Board was a DDA CS8 and the only outboard processing was my DBX1231's and a Driverack 240 for the drumfill. We went ahead and set up mics prior to the bands arriving (Audix mics all around) and rang the wedges out. We assumed worst case scenario with EQ cuts and wanted to be sure we had plenty of gain before feedback. There was a good bit of cut going on up in the 4-6.3k region on the graphics and a few others here and there but we managed to get good levels for even the loudest of bands. I ran pretty full mixes on each of the wedges and alot of everything through the drum fill and the wedges were barely breaking a sweat. Lots of compliments from the musicians about how well they could hear on stage. The drum fill was slamming so hard that the top box almost shook off the top! I had to strap it down. The power and quality of the wedges made it easy for a rookie Monitor engineer to get things pretty solid on stage. My question exactly, scratch and dent works too!! I came home Wednesday evening to find the UPS guy had left me two large packages. My monitors had arrived just in time for a Thursday night gig I had. I was providing PA for a Fund raising banquet for the local FCA (Fellowship of Christian Athletes). Venue was the gym at our local community college, and would be covering about 250 - 300 peoples. Set up the 2 U103 mains on stick to each side and one ATA118 sub center stage, then put out the two M1225 monitors at each corner of the stage for the band. The band consisted of two vocalist, two acoustic guitars, bass, & Djembe (spelling? ), so I didn't have to push the monitors very hard as this was a very laid back gig. The band immediately commented on the clarity of the monitors. I really liked the combination power/signal cables Bennett sent with the monitors. this is the first time I have had much experience with the powercon connections and have found them awesome. This was a talented bunch of teenagers with really great attitude. That in combination with the ADRaudio rig made this gig a lot of fun to do. I ran my drive rack with the rig this trip out and used ASI 23 as a master volume for the individual sends. More pics as I have not figured out how to put more than one per message. Looks like white wine in that glass... very white. I'd be racking up that Bennie for the next few weeks if I were you. What's the black panel below the thingie below your dbx? Is there room down there? If not, you could leave the Furman at home and replace it with a power strip tucked in the back of the rack. Put the Bennie where the Furman was. Put the Bennie where the Furman was. Yes that is a rack drawer below the Digi 002. I have a larger soft side tote that the Bennie travels in. I use the Digi 002 to do some live recording at certian gigs, I didn't have my mac set up with it that night. Just water in the glass, drank a lot of it that night. Second: Thanks to Ales and Franci for providing the demo-rig and for stellar support. First, I've been really pleased with the Q-light speakers. I've never really liked Turbosound, but these are actually very good speakers and extremely versatile. They are worth comparing to the U103 for two reasons: 1) they cost the same, almost to the penny, and 2) they try to solve the same problems and come up with very different solutions. You can see the details at Turbos and ADR's homepages, but the short version is that the Turbo TQ445DP is a bi-amp class D, 3-way design (12"coax + 6" hornloaded mid) with 96/24 DSP, while the U103's are a bi-amp ICE Power, two-way (10"+1,4")all analog design. Both systems try to tackle excellent vocal reproduction, The Turbos with the 6" inch driver, The ADR's with a very warm focused frequency response and even dispersion. The techs there unanimously decided that for rock'n'roll, the TQ445 would be the best bet, but for everything else we would most likely prefer the U103. The dispersion is a major problem with the 445, due to the odd design. I did a cosumer-fair last month with a U103/ATA218 combo and both us and the visiting techs were amazed at the uniformity of the sound image, you could walk the entire hall (1000 capacity when empty) and as long as you stayed within the coverage area, all that changed was essentially the SPL. With the Turbos we would have gotten good results too, but we would also have had to fight low mid build-ups at the center and poor, 'jumping' coverage in the outer parts of the audience area. With the ADR's we got better sound with less effort. In short: The TQ445 was built to be a do-it-all box, and by choosing the odd-ball 3-way design, heavy DSP capacity was needed. The end result is a really good speaker with very good intelligibility (I hate that word) and unsurpassed SPL capacity, but with dispersion/phase issues and limited arrayability. The ADR U103 was designed with pretty much the same goal, but with a very different approach: emphasis is on good solid engineering with a KISS 2-way design with very high quality drivers and a big, wide dispersion horn. Innovation is there in form of ICE powerpacks and 'retro' analog electronics. The result is essentially a much more neutral speaker, with extremely even dispersion pattern. You could almost describe the sonic difference as the Turbos being 'digital' and the ADR's being 'tube-like'. The trade-off is lower SPL capacity and shorter throw. Arrayability was not tested, but I think it is fair to say that the U103 would be the winner in that category. 1) the noise floor. They are really noisy, enough so to make them attract negative attension at, say, theatre gigs. Ales has told that this is being fixed by changing to a better quality op-amp. 2) If you don't use the ASI integrator, be ABSOLUTELY sure that your source has a balanced output, otherwise you will nothing but hum. This is pro-level gear, sure, but it is not particular combat audio friendly. With the ASI, no problem. Actually, the U103 is hard to demo. As I mentioned, they lack that LTL smiley-face sound most techs expect from their PA's, but in real life usage they provide a blank canvas that is extremely easy to mix on: You have to try very hard to make them sound bad, and with a minimum of effort they will sound fantastic. The Turbo and ADR subs are also very different beasts. The ADR's goes a LOT deeper than the TQ425DP, almost 3/4 octave according to the spec sheets, On the other hand the Turbos have more clarity in the 60 -100 Hz range and significantly more punch, pretty much what you'd expect from 18" subs vs. 15" sub. We got killer results by combining them, by the way, making us guess that an ATA412 + ATA218 combo would sound pretty spectacular.... The cardioid pattern of the ATA218 has been a plus in every application so far! Ales claims an 18dB difference between front and rear. I'put that figure somewhat lower, but still impressive and useful - and done without DSP! The ADR's really comes through when pushed: The Turbo subs simply looses dynamic range and starts to rumble in a not particularly pleasing manner (they are bloody loud, though), The ADR's limiters acts more like a slow-attack compressor, so that, for instance, a kick drum will remain a kick drum even at very high SPL's and the box flashing brightly. Very well done indeed. I would like to have a bit more clarity, as they tend to rumble a bit, but the LF extension and dynamic range are really really impressive, probably the best I've heard in any PA sub. After going out on a few small tours with another Lab regular (Dylan Shepherd) using the Eona U103's and ATA 118'sand the M1225's, I got the chance to mix monitors on them at a local radio station gig, with mid-large local band Thirsty Merc. The set up was your regular rock band set up, with Bass/vocals on stage left, Vocals/guitar/keys and guitar/vocals on stage right. I was using single M1225's for the frontline monitors, with a U103 and a ATA118 for drumfill. I had two sidefill monitors, but these were AT Showstacks. My first impression of these monitors is how incredibly light they are. Compared to my favourite monitors to work with (the Clair 12AM's) they're practically feathers. When I eventually got to tune them, they were remarkably flat...from memory I had to take about 2db out of about 4 frequencies for the m1225's...and that gave me heaps of headroom for the band, who liked it loud (they did start feeding when the support act, a bunch of dancing girls, started pointing wireless 58's into them....but that was my oversight). I'd still love to really put some volume throught them (with a local metal band)...but for the size and the weight, they're great. - not as loud as other wedges. - Seem to scratch easily. Overall, they're great boxes, and are definetly on my 'to watch' list. It would be interesting to hear the larger line arrays. Couple of quick things. These look like some really good products. However I do not see anything mentioned on a PIN1 test. Is Pin one connected to the chasi? Also Im assuming a universal power supply. Will they work over seas? That small coax monitor looks interesting there are not many coax monitors that are powered availible in the market that I know of. The only thing I see missing is a place to stick a leg from a tripod stand like the rat wedge which is really rad. The SMAART print screens look good, however coherence isnt shown so and im not sure really how this measurement was taken. You could also use a time window measurement. While were talking about measurements and monitors as any one ever done an alignment adding delay to the monitors to have a phase cancellation at the microphone I think a set up like attached might work. I'm assuming the objective here would be to silence some of the gawdawful screamers using the mics? That would be great! The FBT PSR212MA is another self-powered processed 12" co-ax floor monitor. I love it's performance but believe it is almost twice as heavy as the ADR M1225. Pin 1 is lifted at audio frequencies, grounded at radio frequencies. As you can see from Erik's experience, this works well in most situations, but not all. In order to find a better solution, we've brought in one of the best in the business when it comes to audio shielding and grounding, and we're working through a new method of dealing with the way our products interface at audio and radio frequencies that should make them nearly bulletproof in a wide range of situations. The power supplies are not universal. On speakers with switching power supplies (like the M 1225 and ATA 118) it is possible for a user who is comfortable with electronics to switch the position of one fuse and adjust between 120 and 240 volt operation. On products with conventional power supplies (like the U 103) it is possible to switch mains voltages by swapping a few wires on the input side of the mains transformer. In either case, protection circuitry exists to ensure that if the wrong voltage is supplied the loudspeaker handles it gracefully (read: does not destroy itself). We are happy to adjust speaker input voltage for users at our factory, or they can have one of our distributors do it, or we can walk them through it over the phone. As for having a stand mount hole, we decided early on not to try and make this a "one size fits all" box, with flyware and stand mount, etc. Our experiences with speakers like that in the past have been mediocre, and that format is often abused. We don't want to see the M 1225 used as mains or sidefills, the speaker relies upon half-space loading to maintain even bass response down to the stated 52Hz, and its response has been tuned for near field use. I have used them as front fills by standing them up on an edge, and others have gotten some pattern adjustment by sticking 2x4s under the front or back, and that's all well and good. For mains or sidefills, however, we make the U103 and other speakers more powerful that are designed for farther throw and higher output. As for the Smaart printouts, we took those measurements indoors in an approximately 30'x15'x8' concrete-walled room, with the U103 on a tripod and the M1225 on the floor. The mic was on a stand at my ear height (let's call it 5'6") and in the case of the U103 about 2 meters away. Nothing fancy at all about this setup... we were going to do better measurements outdoors but it started raining and I had a plane to catch. kewl, let me know if you try out that measurement as I just dont have time to do it my self. 1. Slovenia really isn't a make-believe place where elves make cookies in trees. 2. Some of the loudest and best sounding loudspeakers for their size come from elves that live in trees. I'm the current holder of two U103HH tops, AT118HH subs, M1225HH wedges, a little single rack space mixer/controller to aid the demo users and all the necessary cabling to make it work. Each loudspeaker is beautifully executed, self-amplified and glorious analog. Whoever put this stuff together is a passionate to borderline OCD craftsman. For those that got their fur up with the "glorious analog" comment, I've yet to hear a digital audio component that didn't to some degree mess up the sound of something that went through it... except... (1) Benchmark D/A converters, (2) the Dolby Lake processor, and (3) whatever that weird stuff is inside my EAW NT29 boxes - so deal with it! Shame on you traitors and cowards who have sold out the beauty of what first attracted you to this sport at the altar of convenience! Oh, the joy of my comfortable little padded white room with those nice men that always feed me when I ring the bell. My business is such that I rarely do events with fewer than 500 folks anymore, thus the 10" two-way U103's and single 18" ATA118 subs are not on my hot list to buy. Nevertheless, the day after I picked up the demo speakers, a last minute fancy club gig in Destin FL came up. The second surprise was that the band was quite good. The third surprise was that the band's manager was in charge of a large outdoor event coming up in a couple of months and she was so impressed with the sound that I got the gig - roof, stage, flown speakers, etc. What I was really interested in were the active wedges, I've got a dozen 12" Radian Microwedges that I have pleased a whole lot of muso's with - they sound quite good and go loud as stink with their 2" compression drivers. They've also proven very tough, though I do few screamo shows. :) They do have a positive/negative aspect to them in that they have a very narrow pattern where the highs are "right there". On the upside, it forces the muso to live right on top of the wedge to hear things properly thus giving me the ability to keep levels within reason on the stage. On the downside, it forces the muso to live right on top of the wedge to hear things properly thus giving the guy little room to move. The EONA's with their 1.4" compression driver have much broader and smoother HF coverage and give the muso a reasonable amount of wiggle room. Actually, I think the coverage angle of the M1225 is just about a perfect balance. The Radian specs a 90 degree conical coverage while the EONA specs 60. Go figure. I wasn't in the market for wedges, I was happy. Now I'm unhappy. The M1225's sound substantially better than my best efforts at biamplifying the Radian's. They also weigh about 18lb less including their internal processing and amp. They also are within spittin' distance of the same usable maximum SPL. Still, truth be told, the Radian's are way sexier than the EONA's. I noticed, _I mean I heard_ that in the basement Alex attempted to make up for this with a picture of a young lady donning an EONA shirt. Based on my experience around here, I'd say Alex is innocent and Bennett is guilty until proven guilty. The real version of Smaart (v5.4) with a real computer (MacBook Pro) with a D-Audio sound device and a B&K 4007 omni microphone. I measured at a sample rate of 44.1k and 24 bits using a red sweep stimulus for the subs and pink sweep for the tops and wedges. FPPO is for girls. I increased stimuli (love that word) levels until limiting engaged and then backed off 6dB. You madman! That's quite the review... Very informative to see the Smaart screenshots. I'd be curious to compare a screenshot of the M1225 with the limit light getting tickled to your screenshot of performance 6dB below limiting. How much added coloration? Uh oh, I just noticed the PowerCons and the made the connection that I don't have any on the distro. Does the demo rig come with the proper adapters or do I need to get out the screwdriver and multimeter? I've got a ton of powercon to edison cables, Phil. No problem. I'm just gonna toss this one out there for possible future EONA designs. My favorite ADR box of the bunch is the single 18" sub, it's a real asskicker. A good application of it is as a drum fill sub, and here is where my idea for this suggestion was inspired. The way we have been running the sub as a drum fill is up on one end with the "handle" side to the floor. 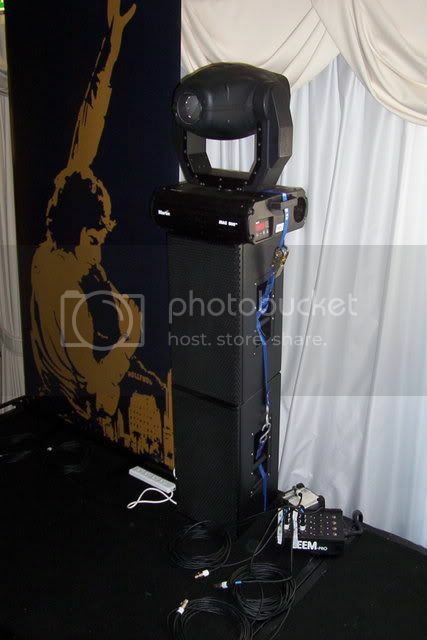 Perhaps it would be good to put some small feet on one of the handle sides of the box so the (very durable) coating doesn't get to messed up when running it in this configuration and having musos and stagehands slide it around the stage (instead of picking it up, it's what, like 65 pounds?). Might also make it easier to slip a handtruck under it too when it is on end. Hey Tom, I'll talk to Ales about that. Sounds like a good plan. BTW, the sub is actually 99lbs. You should weigh it without its little cover! P.S. the specs online say it should weigh about 108 lbs. Is that the "factory" cover from EONA ADRaudio or something made up locally?